MTV recently caught up with writer/director/actor Tim Blake Nelson (O Brother Where Art Thou?) and picked his gamma-contaminated brain about reprising his role as Dr. Samuel Sterns in the rumored-to-be-happening sequel to this summer's moderately successful Marvel reboot, The Incredible Hulk. NOTE: The interview with Nelson was a follow-up to an interview MTV did with super-producer Gale Ann Hurd (The Terminator Trilogy, Hulk, Punisher: War Zone), in which Hurd made it clear that it is her intention to see Incredible Hulk 2 make it into theaters, ideally with all of the original cast in tow. So what do Hurd's words mean for Tim Blake Nelson's future? Last we saw Dr. Samuel Stern, he was seeing green after a beaker of Bruce Banner's gamma-radiated blood spilled on his noggin. So if everything goes according to Hurd's plan, expect Doc Stern to become the the next baddie in line to take on the Hulk, as the gamma-brained evil mastermind known as The Leader. Wow the man has been preparing for his moment in the darklight. And who wouldn't be excited to step up from a supporting role onto center stage as the main villain in popular comic book franchise? Now that we know that Nelson is already prepared for a second outing as Hulk's most iconic arch-foe, the question is where does that leave his nemesis-to-be Bruce Banner, who was played by actor Edward Norton? "We talked about [‘Hulk’] a little bit, yeah; we made some jokes about it,” Nelson remembered. “It’s all good, and I really do hope [the sequel] happens, for all sorts of reasons. So really we're getting the same answer everyone has given about Edward Norton reprising his role as Bruce Banner: Hope he does, not sure if he will. Regardless of Norton's involvement, it looks like The Incredible Hulk 2 is gaining steam and that it will have The Leader as its main villain. Guess that's all fans can ask for at this point. Do you think The Leader will make a more intriguing villain than the Abomination? 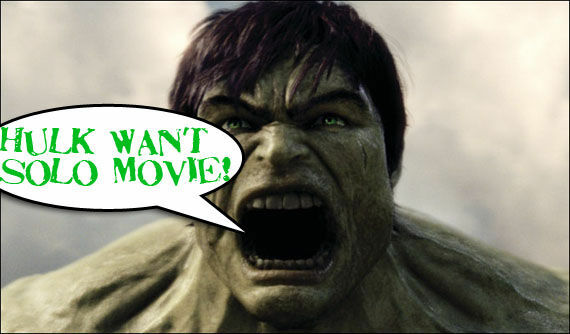 Or are you a person who has to have Ed Norton back on board before you can support The Incredible Hulk 2? Let us know how you feel about this one.